Dozens of men wielding batons and wearing navy blue uniforms and black motorcycle helmets arrived at the US embassy as a small number of activists gathered to deliver a petition signed by 181 NGOs calling for the release of 23 people jailed after a crackdown earlier this month. Tep Vanny from the Boeung Kak lake community and Rong Chhun, president of the Cambodian Independent Teachers Association, were arrested as they left US embassy property along with a staff member of the Housing Rights Task Force (HRTF) and Chheang Thida, director of the Cambodia Union Association at the Kin Tay garment factory in Chak Angre Krom commune. Shortly after her arrest, Vanny told the Post that she had been unjustly detained. “We were questioned related to gathering at the US embassy to file the petition. The authorities always arrest me and other people without arrest warrants,” she said. Two US embassy security guards were seen negotiating with the security forces and protesters during the stand-off. Sean McIntosh, spokesman for the embassy, condemned the arrests, adding that the embassy officials were requesting that the activists demonstrate on public property across the street. “The US embassy condemns the arrests of the activists today who were attempting to exercise their constitutional rights to peaceful assembly and expression,” he said. “We continue to urge the Cambodian authorities to rescind their ban on demonstrations in Phnom Penh. 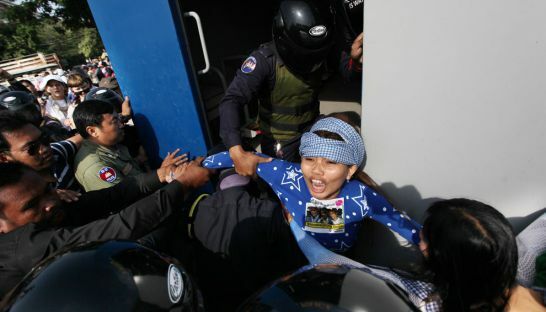 Another seven activists, including prominent Boeung Kak representative Yorm Bopha, were arrested when security forces blocked the road as they attempted to reach the French embassy on Monivong Boulevard. The remaining activists then delivered petitions to the British embassy, the headquarters of Unicef and to Amnesty International Asia researcher for Cambodia Rupert Abbott, who had arrived at the Unicef offices to observe. Phay Siphan, spokesman for the Council of Ministers, said the arrests were a legitimate enforcement of the ban on public gatherings in the capital. Shortly after 11am, activists gathered at Phnom Penh Municipal Police Station to demand the release of the 11 detained protesters. All were released at 1:30pm after signing a document stating they will not “induce or participate” in illegal demonstrations. Ou Virak, president of the Cambodian Center for Human Rights, condemned the use of unofficial private security guards to enforce the ban on gatherings. Government spokesman Siphan said he thought the practice was justified. “They are hired by City Hall. We call them ‘police agents’. They are working at private security [firms] and are hired by City Hall to enforce public order. I don’t see what’s wrong with that,” he said.